Some recovered files cannot be accessed. The main reason for these issues is that some further operations have been made to the target partitition/hard drive after losing your data, which leads to a result that part of your lost data have been overwritten with new files. If this issue happens, we are sorry that no current software is capable of recovering data intactly. However, if you pretty ensure you have done nothing on the partitions/hard drive you want to recover, the 2 deep scan methods introduced in this article will give you a better result. Scan lost data from backup copy of file table and extend the search range in a partition. Usually, the scan method needs more time to be finished, but more data will be listed for you to filter after the deep scan. 1. 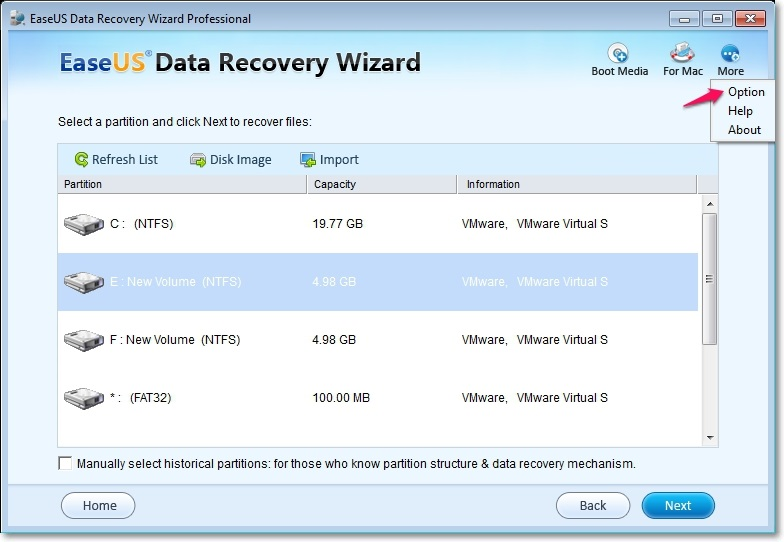 Choose Complete Recovery or Partition Recovery based on how you lost the data, and select the partition or device which you want to recover from, then choose More > Option above. 2.Uncheck all the items in the FAT 12/16/32, NTFS, Common page, and keep the default setting in RAW page, then click OK to apply the changes, program will return to device list page. Then click Next to start the scan. 3. After the Intelligent Searching and file tree rebuilt, program will list all the found files. You can then filter and preview the files first, and select the correct files to recover. 1. Deleted File Recovery does not support this method. 2. In the Partition Recovery, please click Stop if it shows Quick Partition Searching after you click Next to start scan. Then, Intelligent searching starts and please wait till search is finished. As the changes just made are only working for Intelligent searching. RAW option detects the files by their headers taken from sectors of the disk. 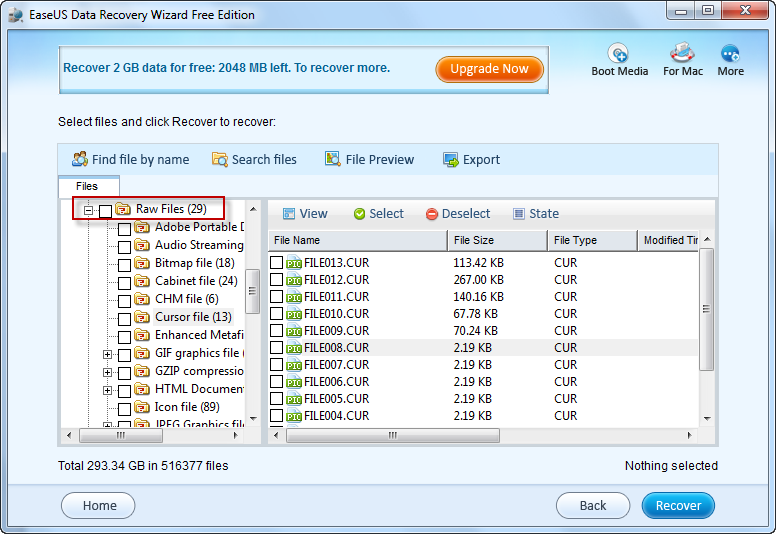 In some cases, the file directory info has been damaged, "RAW recovery" is the only method to get data back. This feature can recover the content of the lost file up to 100% but without original name. So you need to identify the desired files by opening each of them manually. 1. Enter correct recovery mode and select Option to configure the scan after you choose the partition or hard drive you want to recover data from. 2. 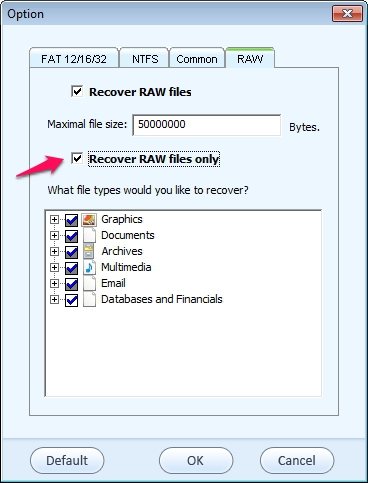 Then switch to the RAW page; tick the checkbox Recover RAW files only. 3. 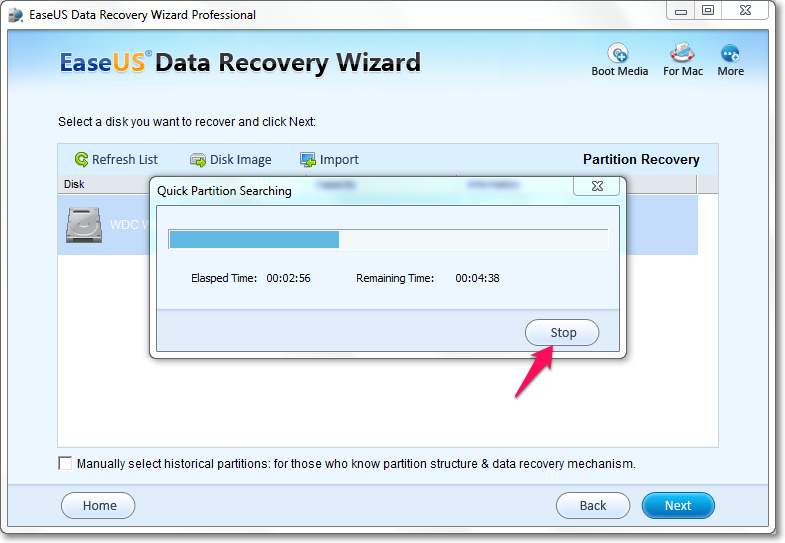 Click OK to ensure, program will return to device list page, select the partition or device which you want recover from, click "Next" to start a RAW recovery. 3. Not all file types are supported by RAW recovery. You can view the exact file types it can support by expanding the RAW file tree in RAW page. 4. File recovered with this method is sorted out by file type and all of them are listed in RAW files folder, as said before, this method detects files directly from data storage area without file directory info, so they all have no original file names. Please filter them by preview each of them one by one. If both of the scan method still cannot help you recover needed data correctly, we are afraid the files are damged already, and cannot be recovered with our product this time.